The croissant almost has it all: rich buttery flavor, flaky airy texture and an overall satisfying taste. The only thing that's missing is a sweet or savory filling to go along with it. Opportunities abound for online pastry students who want to add a new dimension of flavor and complexity to the otherwise simple but delectable croissant. While it may offend the purists, many of your customers will undoubtedly appreciate your efforts to liven up a classic pastry. Croissants are made from laminated dough comprised of water, milk, flour, salt and yeast. Laminated dough's name comes from the technique used to fold it. To make a croissant, start by flattening the dough and placing a layer of softened butter on top of it. The dough is then folded over the butter to encase it, and is then flattened again. This process is repeated about four times to create alternating layers of dough and butter. If you do this right, your croissant will have beautiful flaky, golden layers once out of the oven. This is the result of the water in each layer of butter steaming up while baking to create individual layers within the dough. Your early attempts at making a croissant may require some trial and error, but it's worth practicing to get it right. Just because you intend to fill the pasty is no excuse to slack on getting as close to perfect as possible. You'll feel all the more proud of what you've created, and your customers will know the difference. 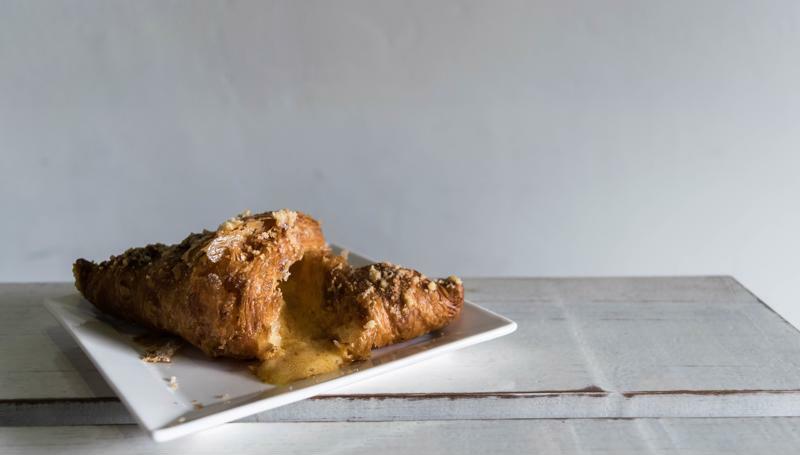 A croissant is also a vessel for sweet and savory fillings. On to the stuffing. There's more than one way to fill a croissant, and the easiest is to cut it in half and add in your ingredients. While simple, the wealth of sweet and savory possibilities from this practical technique are sure to lead to a crowd-pleasing croissant. Wedge smoked salmon with cream cheese and chives in your croissant. Split the pastry open and unfold it into a flaky bed for eggs benedict. Or go the sweet route, and serve your croissant with brie and strawberries in the middle as in this recipe from My Blue & White Kitchen. If you need proof that your croissant creations will sell, look no further than Vive La Tarte, an up-and-coming San Francisco chain whose most popular item is a "tacro," according to Eater. Just picture taco fillings over a croissant pretending to be tortilla. Option two is to fill your pastry with any imaginable ingredient: boiled apples, blueberry jam, custard, Nutella, almond paste, dark chocolate, eggs, cheese, shredded chicken, etc. This route can be a little more involved depending on what filling you decide to use, but it's nothing that we can't show you how to master in our online pastry program. Whether you're just experimenting, or you're seeking your next hot-ticket menu item, this is the pastry you're looking for: stuffed croissants.